After their "Deep German Jazz Grooves 1956 - 1965" with a focus on Frankfurt/ Main the music producers Ekkehart Fleischhammer and Stephan Steigleder return with another survey on the early jazz scene of the German Federal Republic. This time the focus is on the Rhineland - at least regarding the recording locations. Four of the eight pieces on this CD were recorded along the Rhine. The German Amateur Jazz Festival took place in Duesseldorf from 1955 to 1965, Cologne had Gigi Campi - but more on that later. Following the repeated success of the German Jazz Festival of professionals in Frankfurt/M (since 1953) the idea of a similar annual event for amateur jazz players was obvious. Karl-Heinz Lyrmann, then acting president of the Hot Club Duesseldorf seized it. Amateur Jazz in the two categories Old Time and Modern was the most widespread youth music in the country until the arrival of beat music in the sixties. Conventional music educators and youth caregivers with their lute and flute ensembles became jealous because almost every grammar school but at least every small town possessed one or more bands. Ever active since the thirties, the Hot Clubs of Duesseldorf and Cologne that were illegal during the Nazi era, competed with Frankfurt for a reputation of the leading representative in German jazz and for the seat of the German Jazz Federation (DJF). Thanks to its Amateur Festival Duesseldorf was at eye level with Frankfurt. With the attractions of its mostly intact “Altstadt” (old town), the once again quite elegant city on the Rhine had to offer quite a bit to his guests who traveled there to enjoy jazz after the war. In 1955, I had participated in the first amateur festival (and then in all others) with the modern Hans Buchmann quintet from my university town of Halle on the Saale as a guest from the German Democratic Republic. I still like to remember the vibrant Rhine night life in the narrow streets and alleys as we did not know it in the “socialist uniform gray“ of East Germany. At the entrance to the old town the "Kommoedchen Theatre" of the rebellious comedienne Lore Lorenz signaled the, for East Germans, adventurous freedom to slug it out over philistinism of any kind, and even the one of our authorities. In the narrow as a pipe but four storeys high Hungarian restaurant Csikós of the Austrian jazz fans Otto Schuster and his wife Trude, the band of the clarinetist Fatty George from Vienna played intoxicating Dixieland. The spiral staircase and the walls of old wood, the perfectly tapped Pilsener Urquell served by a lift to the upper floors, one could not forget in a lifetime, once tasted, the delicious goulash soup at Csikós. Who - after a night like that - took a nightcap in the so-called liquor shack at Kreuzherreneck on the Rhine side of the old town, was glad to be informed that the designer of the corner pub`s windowpanes with famous beverage brands from around the world etched into the glass, Guenter Pelzer, also played washboard virtuosically when the brilliant graphic artist and book illustrator Horst "Floetchen" Geldmacher improvised swinging choruses on the recorder. Never been forgotten to note that you can read this scene in the novel “Die Blechtrommel” ("The Tin Drum") by Guenter Grass, who had also played the washboard at Csikós. Three of the aforementioned four Rhine tracks on the CD hail from the festival, and you will excuse that their sound - despite the timeless modern improvisations - is still connected to that Duesseldorf atmosphere for me. 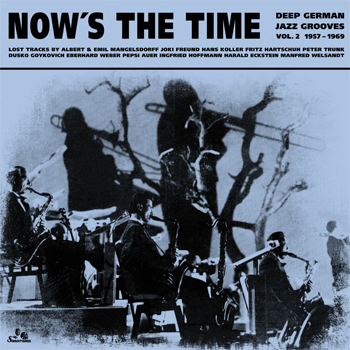 Originally from Heidelberg vibraphonist Fritz Hartschuh, a longtime member of the Wolfgang Lauth combo, starts to improvise immediately with his Frankfurt quartet in 1962, so that, at a superficial hearing, one does not recognize the theme of "Summertime" before the piano solo. The pianist Manfred Welsand (1933 - 2010) from Essen shines in three-quarter time, also in 1962, with his own immaculate "Manny's Waltz". The "St. Tropez Waltz" of the Modern Jazz Crew Stuttgart around bass player Eberhard Weber from 1963 comes up like a “steam waltz” in a compact brass arrangement by Thilo Kalke, but dissolves immediately in airy trumpet and alto saxophone variations. Perfect! Directing one's attention to the recording locations of all eight pieces on this CD, one can gather the correct impression that the widely respected jazz festivals in Frankfurt/M and Duesseldorf had almost caused a festivalitis. Actually jazz festivals and festival-like events shot out of the ground like mushrooms between Essen and Nuremberg, Zurich and Dresden in the second half of the fifties and in the sixties. The jazz sessions with special soloists assembled over the phone, promoted by the German “Jazz Pope” Joachim-Ernst Berendt from 1955 for his radio programmes in the Suedwestfunk (Southwest German Radio), were quite similar to festivals. Although not exclusively produced in Baden Baden, like "Minor Conversation" recorded 1957 in Frankfurt /M, they were once released on a double album entitled "Hello Baden Baden 1955 – 1960" (on Delta Records). The illustrious cast of three tenor saxophones and a baritone sax in the tradition of Woody Herman's Four Brothers sound conserves - like the soundtrack to a TV crime by Juergen Roland - maybe most of the spirit from the cool fifties. In West Berlin, the promoter Wolfgang Jaenicke invited to his “Jazz Salon” in 1959 for the first time. Already in the end of the prudish forties, jazz fan Jaenicke published the ”Gondel“ (“gondola”) as chief editor in Hamburg, refining the harmless pin-up magazine through the ”jazz echo“ tacked in the middle part. In the fifties, Joachim-Ernst Berendt had the editorial responsibility under the alias Joe Brown, then in the sixties I did. The Jazz Salon was launched by the "new jazz circle berlin" based in the America House at the station Bahnhof Zoo, where Jaenicke presided at that time. This first jazz festival in the divided city recruited the best West German professional players and amateurs with little international participation and was replaced in 1964 by Berendt`s “Berliner Jazz Tage” (“Berlin Jazz Days”) with the West German impresario Ralf Schulte-Bahrenberg. After all, the Jazz Salon had its highlights too, not optimal represented by Horace Silver's composition "Nica's Dream" by the Albert Mangelsdorff Jazztet from Frankfurt /M. In the same formation one had already heard the Frankfurt All Stars more inspired - for example on the CD Joki Freund`s "Din-A-Bop" from 1961 with much more compelling choruses of Peter Trunk (b), Joki Freund (ts), Dusko Goykovich (tp), Pepsi Auer (p), Rudi Sehring (dr), Albert Mangelsdorff (tb), and above all his notoriously underrated brother Emil Mangelsdorff (as), clearly inspired by Charlie Parker. Bebop spoken here! In my time as jazz editor of Radio Bremen (1959 – 1968), of all the ensembles on this CD I was nearest to the Harald Eckstein sextet. The band had an artistic level reaching far beyond their amateur status. Harald Eckstein was a solid keyboard player with a compositional sense of compact structures, the black ex-GI and trumpeter William McKay leaned into the warm sound language of bebop luminaries like Howard McGhee, Clifford Brown and Fats Navarro, alto saxophonist Jochen Voss gave an idea of the formerly brand new, yet bluesy freestyle by Ornette Coleman in the improvisations - the shape of jazz to come. When I first got the chance to promote the matinee at “Volksbildungsheim” in spring 1968 at the German Jazz Festival in Frankfurt /M with blues and soul acts and honorary funds by Radio Bremen, it was probably a mistake to set Harald Eckstein on Soul Jazz. In addition to the stunning performances of blues pioneer Alexis Korner from London and the Dutch blues-rock band Cuby & Blizzards the jazz quality of the band could barely develop. However, the here presented live recording "That Double Thing" from the International Amateur Jazz Festival 1969 in Zurich shows the Harald Eckstein sextet in best form. Since the orchestra conductor Kurt Edelhagen (1928 - 1982) had left the Suedwestfunk (Southwest German Radio) in 1957 to build the first fully international Big Band in Europe at the financially powerful WDR (West German Radio), the Cologne station is the first choice for large orchestral jazz in the world - until today by the WDR Big Band. From 1958 Kurt Edelhagen established a jazz class at the Cologne University of Music, of which many prominent musicians arised, and worked there as a lecturer until in the Sixties. But the real godfather of the jazz scene in the “cathedral town” was not Edelhagen, but the owner of the “Eiscafé” (Ice & Coffee house) on the Hohestrasse 111, in one of the first pedestrian zones of the Federal Republic: Gigi Campi (1928 - 2010). 1925 Campis parents had opened the first Italian ice cream shop in Cologne. His father, former deputy socialist mayor of Milan, was seriously injured in 1924 in a street fight with Mussolini's fascists and fled to Germany. In 1939 he sent his eleven year old son Pierluigi (called Gigi) back to Italy to a Jesuit boarding school in order to protect him from the Hitler Youth. Gigi belonged to the left-wing, wrote for the magazine "Avanti", studied architecture and - upon returning to his hometown Cologne - shortly developed the in 1959 reopened “Eiscafé” to a cultural meeting spot, where artists and intellectuals such as Heinrich Boell, Joseph Beuys, Juliette Greco and Maria Callas hung out next to jazz musicians from around the world. For me, Gigi Campi was one of the unsung heroes of jazz in the Federal Republic. In 1954 he founded Mod Records, the first European label exclusively for modern jazz and published its own, irregularly released journal "Jazzette". 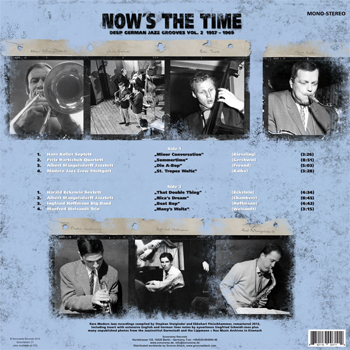 As a born manager and organizer, he promoted over 400 concerts in the Cologne area with top names in jazz and - his greatest achievement - created, along with the Paris-based American drummer Kenny Clarke and Belgian master arranger Francy Boland, the unique Clarke Boland Big Band consisting of European and U.S. top musicians living in Europe, with whom he produced 35 LPs. In collaboration with partners, the WDR and the Cologne office campuses, Campi launched his first festival “Jazz am Rhein” ("Jazz at the Rhine") in autumn 1967 at the Tanzbrunnen, the former site of the Federal Garden Show, at “fifty Pfennig” ticket entrance in the afternoon and “one Mark” in the evening. Eighteen bands played for around 12 000 visitors. One of these was the Ingfried Hoffmann Big Band, they arose from the work of the keyboard player at the Academy of fine arts in Remscheid and were exclusively equipped with high-profile players. As I knew Gigi Campi`s taste, the groove, that Ingfried Hoffmann struck on the Hammond organ to the sharp brass accents of the band in the here presented tune "Beat Bop", must have been “his thing“.